Hillary Clinton speaks at the Clinton Presidential Center in Little Rock, Arkansas, on Saturday. Ready for Hillary, a super PAC supporting a Hillary Clinton White House run in 2016, thinks she can expand the electoral map. First, it wants to target Arkansas, Indiana and Missouri because of her white, working-class appeal. Second, it’s aiming for Arizona and Georgia because the group thinks the states are trending toward Democrats demographically. It’s possible, but unlikely. If anything, the first three states have become less sympathetic to Democrats in recent years. And there’s no evidence that Clinton is the exception. Georgia and Arizona have become more diverse, but they’ve yet to become more Democratic. Ready for Hillary’s logic appears to rest on the idea that President Obama has underperformed in these states, so those states’ GOP-lean in the past two presidential elections is misleading. But they’re red through and through. Gallup has provided party identification data for each state since 2009. (We only have 2014 data for Arkansas and Georgia, which had key Senate races.) I took the Democratic advantage in party identification over Republicans in each state and compared it with the Democratic edge nationwide to see how these states compare to the nation. In all five states, the Republican lead in party identification is at least 5 percentage points greater in the past two years than it was nationwide. It’s not just that voters in these states dislike Obama. They dislike Democrats. In the first “bucket” Clinton targets — Arkansas, Indiana and Missouri — voters were about as Democratic-leaning as the nation in 2009. Since then, however, voters there have shifted away from the Democratic brand. The Republican lead in party identification among Arkansans, Hoosiers and Missourians is now about 10 percentage points greater than it is nationwide. Republicans hold more than 60 percent of the seats in both houses of the state legislatures in these states. And the GOP majorities in all three states increased after the 2014 elections. So, it’s not like Clinton can localize these races. These states are solidly Republican from the top down. Arizona and Georgia have long been listed by Democrats as potential pickup opportunities because of each state’s growing racial diversity. And it’s possible they’ll become presidential battlegrounds. But there isn’t any sign that will happen in the next two years. Voters in Arizona and Georgia leaned more Republican than the nation five years ago, and they continue to do so. If these states were becoming more Democratic, you’d expect at least some movement toward the Democrats in terms of party identification. There hasn’t been any. And like in the first bucket states, Republicans hold clear majorities in both houses of Arizona and Georgia’s legislatures. 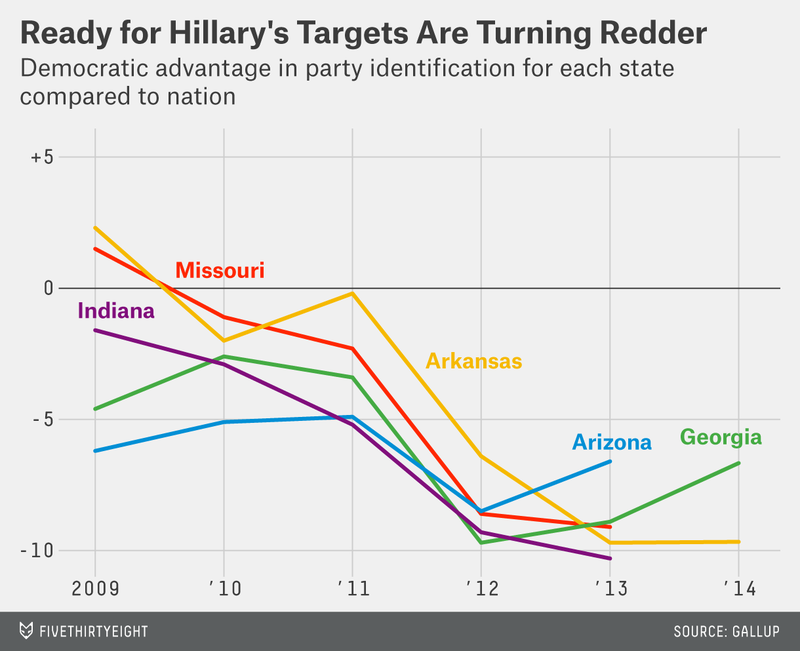 None of this is to say that Clinton can’t win these five states in 2016. But if she does, then chances are she will have already won the White House — Arkansas’s, Indiana’s, Missouri’s, Arizona’s or Georgia’s electoral college votes would be superfluous.